every time i go to 'steckfensters' i have a bizzare and amusing experience. not surprising really as this wonderful shop full of antiques and curiosities in penzance is bound to attract the eccentric and curious. taxidermy creatures abound, a darlek, an array of vintage bicycles and weird and wonderful objects are crammed into this unique shop. i totally failed to buy a mackerel box i fell in love with (i wrote a post about it back in june). at that time i was told it was £40. by the end of the summer it has gone up to £60. the next week i was told it wasn't for sale and the following week i was told that it had been sold. 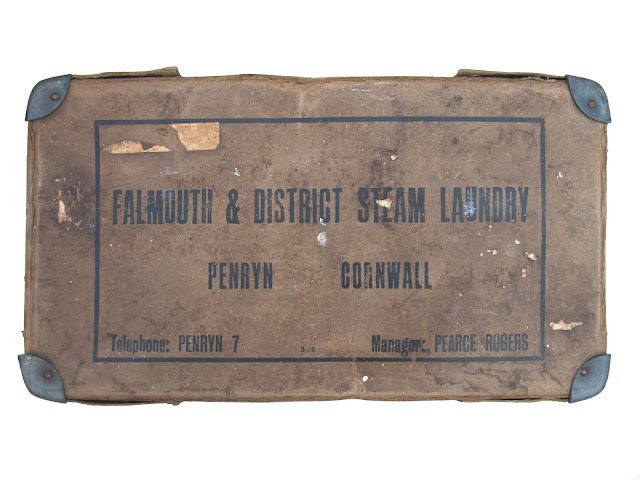 so when i spied a rather beautiful old 'falmouth and district laundry' box my instinct was to avoid asking the price as i thought it could be complicated. during my last visit i was looking at some old books. out of the corner of my eye i noticed an elderly man lurking next to me. i glanced over at him, he smiled and said, "i bet this shop is right up your street isn't it". it wasn't long after my exhibition when i'd spent a week chatting to a huge number of people and the following saturday about three people i didn't know smiled and said hello to me in sainsburys. i thought to myself, i wonder if this is the beginning of the dizzying heights of local fame! i wondered if i knew this man, if maybe he'd come to my exhibition as he acted as if he knew me. i resumed the conversation to try and discover more and we chatted about all the amazing things in the shop. he followed me around as i examined various objects and when i left my details regarding the mackerel box, he leant over and looked at my name. the lady in the shop had just phoned her husband who had said the box was no longer for sale. disappointing. the old man piped up "well, go for it jo- give him a higher offer. if you really want it, it's worth it". i explained that it wasn't for sale and was slightly alarmed that he was now using my name. "so jo, " he kept saying and managed to turn the conversation to his tango lessons. it was becoming quite amusing and i could see where it was heading so i let him continue. "so jo, do you dance?" - "no," i said, "absolutely not". and he looked a bit disappointed and as i left he said, "bye jo, bye". when i went in yesterday i was lucky enough to overhear another conversation that made me smile. another elderly man but this time quite posh came striding in. "i see you have nearly what i want but it's not quite right". the owner of the shop: "oh what's that then?" posh man waving his hand towards a vintage mannequin speaks in a commanding manner: "i'm looking for a girl, a nice looking girl, for the back of my (i forget what he calls it but it sounds like a flash open top vintage car). he explains about it having a special fold out back seat which he sadly never gets to use but if he had a "girl" it'd be a different matter. "yar, must be sitting, must be, you know, nice looking". shop owner: "well, it's very rare to find one sitting. does it need to have legs?" posh man: "oh yes! she must have legs!" and he turns to leave. "well keep an eye out for me" and he strides out. i burst out laughing. i return to the laundry box. the shop owner comes over and i explain that i was the one who tried to buy the mackerel box. "oh, that was a tricky one" he says. "you see i was offered £150 for that. it went to a museum". i think, that's very strange, as when i last came in his wife said to me, "your box. it's gone. he sold it to a girl for £65 just a couple of days after you were here". so i tell him that that's not what his wife had said. and he quickly replies, "well, that was just a cover story". there's definitely something a bit fishy going on! he asks me if i live in falmouth and i tell him i do. "well, this is the box for you then! the other one was from newlyn". i admire his sales tactic, i go along with it and although i much preferred the mackerel box i come away with a rather beautiful laundry box for £20.